But if Surface is aimed at the OEMs—telling them “we can do this just as well as you can, if we have to”—and setting them a challenge—”your tablets have to be at least this good”—then the limited availability isn’t necessarily such a big deal. As long as the OEMs heed the warning and raise their game, so that Redmond can be assured that bad hardware won’t jeopardized Windows 8’s success, Microsoft could safely keep Surface operating as a small-scale operation, playing the Nexus role without upsetting the PC market. 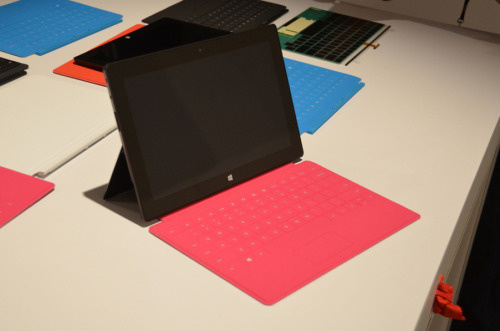 The Verge has the best earliest coverage of the Microsoft Surface press conference and pretty photos. In Windows 8 you can still register a desktop application to handle a particular URI scheme, but now you can also register a Metro Win8 application to handle a particular URI scheme. No more manually modifying the registry - now there's pretty UI in VS to handle this. Use of my old Hotmail account has really snuck up on me as I end up caring more and more about all of the services with which it is associated. The last straw is Windows 8 login, but previous straws include Xbox, Zune, SkyDrive, and my Windows 7 Phone. I like the features and sync'ing associated with the Windows Live ID, but I don't like my old, spam filled, hotmail email address on the Live ID account. A coworker told me about creating a Live ID from a custom domain, which sounded like just the ticket for me. Following the instructions above I was able to create a new deletethis.net Live ID but the next step of actually using this new Live ID was much more difficult. My first hope was there would be some way to link my new and old Live IDs so as to make them interchangeable. As it turns out there is a way to link Live IDs but all that does is make it easy to switch between accounts on Live Mail, SkyDrive and some other webpages. In the Xbox 360 system menu you can change the Live ID associated with your gamertag. This worked fine for me and I got an email telling me about the transfer of my Microsoft Points. There's no way to do this for the Zune specifically, however changing over your Xbox account also transfers over all your Zune purchased content. I don't have a Zune Pass so I can't confirm that, but all of my previously purchased television shows transferred over successfully. To change the main Live ID associated with your phone, reset your phone to factory default and start over. All purchased applications are lost. Had I purchased any applications I would have been pissed, but instead I was just irritated that I had to reset my phone. I don't use my Hotmail account for anything and it only sits and collects spam. Accordingly I didn't attempt switching this over. I didn't have much in my SkyDrive account. I downloaded all files as a zip and then manually uploaded them to the new account. In Win8 you login with a Windows Live account. If you hook up a custom domain to a Live account you can login with that custom domain. The Metro Developer Show is the first podcast exclusively for Metro developers and enthusiasts. Each week Ryan and Travis Lowdermilk traverse the exciting world of Metro (phone, tablet, desktop and Xbox); covering the latest news and exploring what it means for the developer community and everyday users. Documentation for the VS JS profiler for Win8 HTML Metro Apps on profiling apps running on remote machines.